Cheers to our great achievement!! With years of dedicated support and loyal followers on our side, we are proud to announce that one of our best work ColorMag has managed to reach 100,000+ active users milestone! And we are extremely thankful to our users for helping us help you! 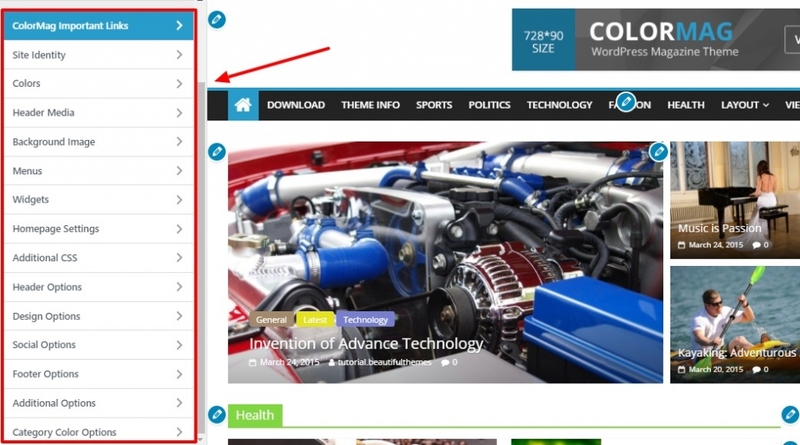 And, ColorMag is undoubtedly the most popular free magazine WordPress theme at WordPress.org. With dedication and effort, our team of developers, designers, and bloggers at ThemeGrill have always strived to bring nothing but the best experience for our WordPress Users. And it brings extreme joy to us when we reach our aim to do so. And while we are still working to better our WordPress products, here is to celebrate all of those who helped us reach where we are today! So, let’s take this time to celebrate this success together. Cheers! How ColorMag managed to become the #1 Most Popular Free Magazine WordPress theme? The first ever version of ColorMag released almost three years ago on March 25, 2015, and we never had to look back since. 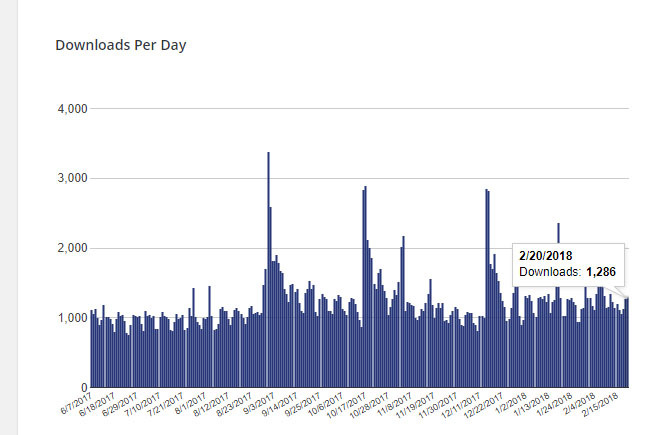 From the very first week of its release, the theme has been successful to remain in the ‘popular‘ category at the official theme repository i.e. WordPress.org. It’s definitely the only magazine theme at WordPress.org to reach the 100,000 milestone and yes, one of the few themes in general. But the question remains? Why has ColorMag managed to remain on the top all these years? So, we are here to discuss this with you all of our happy users and valued customers. Rather than bragging it on our own, your reviews and feedbacks tell it better. Anyways, we take this time to share our part of the story. Well to answer it simply, this theme is visually appealing, efficient, optimized for SEO and speed to say the least. Great for any newspaper, online magazine, blogs, and corporate sites, it is also the trust of our faithful and loyal customers that have helped us reach our goals. And we have competed against hundreds of other themes to give our customer always the best! And thus with both our efforts, today, we can proudly boast that ColorMag by ThemeGrill is the number one magazine styled WordPress theme and has over 100,000 active installs as of now! 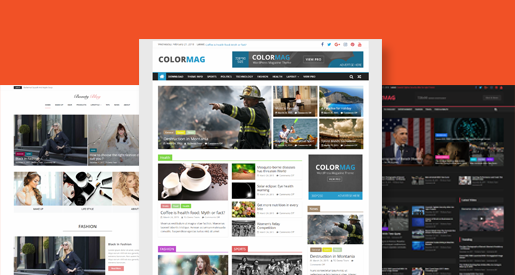 Boasting our feature-rich WordPress magazine theme-ColorMag, we are proud to say that the daily installation is still as high as it was when we first introduced the theme with over 1k daily installs. And the major achievement we have managed to gain with ColorMag is that this theme has remained on the top of the list persistently for years without any downfall! And why do we mention this? Well, with our active effort to give the users exactly what they need, we have managed to keep up with all the latest and advanced themes that are released every day. 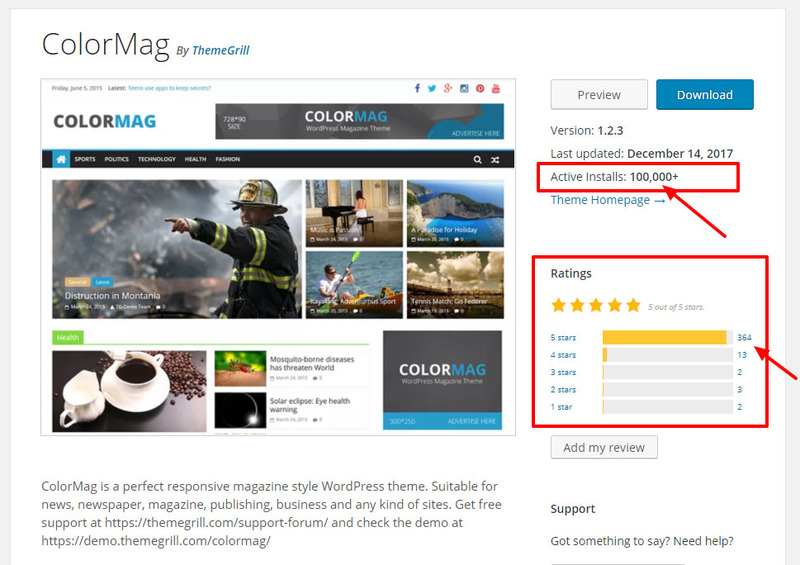 And thus our theme ColorMag remains the #1 most popular WordPress Magazine theme out there. If you still haven’t tried ColorMag for your online publishing website yet, here is why you should try it out for yourself and join thousands of our loyal customers. And what makes it so special and effective and worth the splurge? Let’s take a look and find out for yourself. Yes, this is for you if you have not yet tried this theme. We are just trying to put it simply as far as possible. ColorMag is a simple and user-friendly free WordPress magazine theme which enables you to create beautiful looking and professional online magazine and new websites easily. Moreover, it is a feature-rich magazine and news template for WordPress that is crafted and designed with online publishing websites in mind. Perfect for any news, magazines, business and corporate sites, this theme features fully responsive outlook. Add a touch of professionalism and sleekness to your online site with the number one most popular Magazine WordPress theme at wordpress.org. What’s not to love? ColorMag comes in both free and premium versions and if you want to try it out first for free, then you can with absolutely no cost! The theme also covers a lot of customization option like color schemes, typographies, and layouts to choose from. If you want to build your users to customers, the theme is also fully WooCommerce compatible. 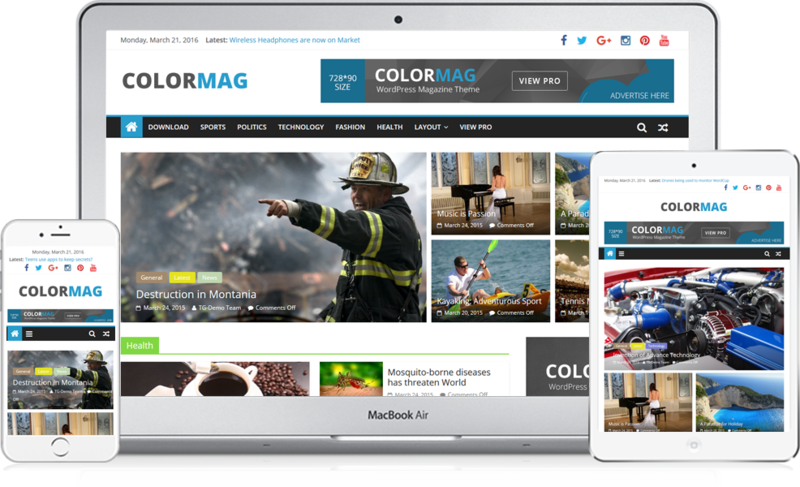 Look no further for a magazine or news WordPress theme as ColorMag is the answer to all of your needs. That’s right! The responsive designed layouts make sure that your site adjusts with any device and scales and displays it accordingly. Adding a touch of professionalism, the design of the theme fits perfectly with any contents of yours to keep your users hooked. It goes along with the modern outlook that perfectly showcases all of your site’s content in a magazine style. Whether you own a news portal, magazine, newspaper or a blog, this theme goes along great with almost anything you want! ColorMag is a free theme but definitely professional with premium-like features! Yes, you heard it right. The ColorMag theme comes with a set of multiple ready to import demos which gives you an easy and quick option to build a website like the demo sites. The demo sites are definitely the fine-tuned forms a theme can be; the best possibilities of a theme presented. So with single click demo import option, you can just import a demo you like the most and quickly customize it with your content. The theme has four predefined ready to import demos for the free version while there are seven astonishing demos for its premium version. View all ColorMag demos here. With the free version of theme installed, you can directly import all the four free demos (Default, Beauty Blog, Business Magazine and Dark Demo) from the ‘Demo Importer‘ in the Appearance menu. You can first preview all of these demos and pick anyone that fits best with your need. The best thing about ColorMag is that this theme is also really customizable which means that almost any element of the theme can be customized exactly the way you want. You can change the color schemes along with the primary color option. Moreover, you can also choose from over 600 google fonts, which comes integrated along with the site. Change and edit any element and match it with your preference in order to build that perfect Magazine or News WordPress website. Anything is possible with ColorMag! Whether you want to create a stunning homepage or change the background color or image of the site, it is easy as a breeze. You can even add your own custom CSS and design the site exactly like you wish. Add menus, header media with titles and logos! Get the unlimited option to customize your site! The best way to help you out with WordPress is probably the widgets that are made available for WordPress users for easy access and functionality. And ColorMag features more than enough space to include those useful widgets on your site extremely easy. Simply drag and drop the widgets onto the 16 widgetized areas to make your site efficient and menus more easily accessible. You can add widgets on almost all major areas of the site including the header and footer. And what’s more? It comes with over 6 custom widgets targeted in a way to create a professional looking site just for your use. Further, it has Feature & Highlight Option that may be interesting to you. Want to display featured content on your site with a touch of a button? Now you can with ColorMag. You can show your latest posts from any category in a highlighted design, especially on your front page. Moreover, you can also choose the style that you want your featured section to display your contents. The free versions allow you two different options to showcase your featured post while your the premium version has seven different sections you can choose. Let’s talk about creating and customizing the theme! The theme allows you to either build the site the old-fashioned way or there is an awesome alternative to do so! The great thing about it is that this theme features Elementor Page Builder. The easiest and the fastest way to design and customize your site in the instant, real-time preview! And that too with zero coding knowledge! Simply add elements and edit the designs through the open-source front-end page builder with everything that you might need and that is it! Simple, effective and fast, ColoMag offers you the full compatibility! Not only this with ColorMag you also get access to the widget blocks developed especially for the theme! Any website whether it is a simple blog or a professional site depends on one major aspect when attracting users. The SEO of the website. And ColorMag is optimized for SEO which means that it is fully compatible with the popular SEO plugins like Yoast SEO. This makes sure to utilize the titles and tags to deliver it to the Search Engines increasing your daily traffic. And this remains the major reason why ColorMag is a magazine WordPress theme. Follow the basic guidelines, focus on the keywords you use, find the usage and density of the keyword on your site and adjust according to your need. And do not worry, because these plugins will help you out with all of the processes! And with ColorMag, get the best and start optimizing right away. One of the major requirement for any site targeted at audience worldwide is the option to translate and be multilingual. And with this theme, you get it all! The theme provides RTL support. Which means that most RTL languages all over the world are also compatible with the theme! With the premium version, you also get full compatibility with WPML plugin in case you want to create a multilingual site. Great to bring out the international audience on your sites doorsteps, this is the feature that will make your site stand out the most. Want to turn your users and audience into paying customers? No worries at all, because this WordPress news theme is also fully compatible with WooCommerce which enables you to add products and memberships along with payment methods. The plugin is the official eCommerce solution for WordPress and one of the best eCommerce platforms in use globally. And the good news is that ColorMag theme has full compatibility with this plugin. Simply install the WooCommerce plugin, set it up in minutes and start your business right away! Share your posts and contents from your site in a matter of minutes as being social has never been easier. ColorMag comes with a bunch of social icon button which can be utilized in the header or footer to help you connect with your social platforms. Easily share contents on your site or vise-versa with the integrated social icons buttons. Whether you want to share your contents to your social sites, or when you want to interact with your followers, social buttons act as a bridge in between. Increase your user’s interaction rate, engage with them, get more social followers all with a click of a button! To help out our valuable users in need, our team of dedicated developers is always ready. For free themes, we provide support through the support forums. And if you are one of our premium users, you can present your query to us through emails, live chats as well as support tickets. But if that is a hassle for you, you will also get theme related queries answered in our clear and thorough documentation and instruction of how to use them to your benefits. If you are wondering where to get the support that you require to solve your problem, here is a handy guide to help you out! If you are confused how and where to get WordPress Support, here is how. WordPress Support for Beginners – ThemeGrill Customer Support Exclusively Explained! And that only sums up the major features because ColorMag offers even more! Here is a look at more options than the theme provides other than the ones we have mentioned above. Cross Browser Supporter: This means that your website will load faster and effectively in any major browser that your users might be visiting your site from. Demo Content Available: Start off your website with demo contents so that it looks appealing right away! Sticky Menu: Create a sticky nav bar which stays in place on the top even when users scroll through your site! Boxed and Wide Layouts: Experience great visuals and extra appeal with boxed layouts that is large for your convenience. And this is not it because ColorMag offers a lot more features than mentioned above. If you want to view all of their advanced features, Click Here. Celebrating our greatest achievement we are nothing but thankful towards our loyal customers and valuable followers. With over 100,000 active installs we aim to reach even further goals that we have targeted improving our user’s experience. And by the end of this post, we are pretty sure that you get the idea of why ColorMag is the best WordPress Magazine theme that you can find. With advanced features, and equally appealing layout and design, our theme is developed with nothing but the best in mind! Optimized for SEO and speed, with ColorMag you can create the unique and professional looking website in a matter of minutes to compete in the tech-savvy environment. Giving you the advantage of edginess and efficientness, the theme is simply the choice to opt for. Whether you own a blog, newspaper site or an online magazine, this theme works best for all of it! So why wait? Try it out for yourselves today and join the belief of thousands of other happy customers right away!